Fans of The Walking Dead are presumably too busy wondering just how the show will handle the finale’s take on that iconic comic moment to worry too much about any other elements from the comic series heading to the show in the future. But this is a gamechanger of a different scenario, as today saw the release of The Walking Dead: Alien, a one-off tie-in issue that shakes up the continuity by introducing not only a character that was merely hinted at in the earliest days, but also the spear-wielding Claudia, a post-apocalyptic badass that needs to find a way to the live-action zombie drama as soon as possible. And it isn’t so impossible an idea. Since The Walking Dead: Alien is well worth experiencing in its brief entirety, I will tiptoe around spoilers here. The action takes place in Barcelona - during a time period that feels important enough to leave out here - and follows the aforementioned unseen-before-now character for a spell before bringing in Claudia and putting the pair into a dangerous situation that is both similar and different to things we've seen in the standard timeline. It’s an incredibly interesting read for several reasons, not the least of which is getting to see a completely different part of this walker-filled world for the first time, and my biggest takeaway was easily how brilliantly and smoothly Claudia could be inserted into the TV show. She gets a fantastic first image that oozes fearlessness, showing off both her sweet weapon of choice and the striking visuals of her armor and transportation. Her femininity comes out in more personal moments with unexploited sexuality, and the bilingual character employs pragmatic logic to all situations that come up. And not without a sense of humor, either. The other character is fine and everything, especially since it involves that huge connection to some of the core survivors in The Walking Dead universe, but Claudia is simply solid all the way around. And in such a short amount of time, too. The issue ends as Claudia is given an almost too interesting idea to contemplate, and that idea is one that could possibly bring her over to the world of The Walking Dead proper, should the creative teams decide to go in that direction. It would obviously make more sense for it to happen in the comics than the TV show, at least right away, but Alien could easily work as the source of a standalone episode or series of flashbacks that work Claudia’s history into the ongoing drama. And it wouldn't take all that much additional input. Hell, if it had to happen that she could only join Fear the Walking Dead somehow, I'd be into that, too. Claudia could turn Madison into a beast. To add the obligatory comparison, Claudia really comes across as the ideal combination of Daryl and Carol: a rebel warrior whose impulses are brainy rather than scattershot and angry. She could easily watch Rick and/or Michonne's back on missions outside the walls, and any villains would be wise to stay the hell out of the way when she's coming through. Maybe it's the way Jessica Jones utilized its central character's attitude and physical prowess, but I couldn't help picturing Krysten Ritter as a live-action Claudia. That said, there are untold numbers of actresses who could pull this off. 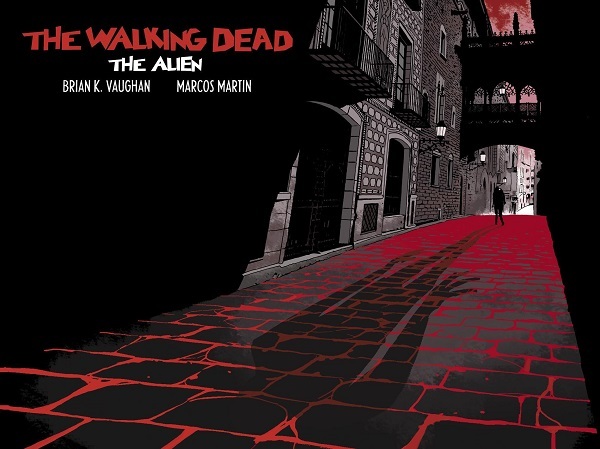 Rather than being a Robert Kirkman/Charlie Adlard effort, however, The Walking Dead: Alien was put together by the elite storyteller Brian K. Vaughn (Y: The Last Man) and Eisner Award-winning artist Marcos Martin (Daredevil) under Kirkman’s lax supervision. It was released through Vaughn and Martin’s Panel Syndicate as a pay-what-you-want offer – buy it here – so I’m not sure how rights and things go, nor whether Kirkman would be interested in taking on someone else’s creation into his own work. But he recognized the quality of the character enough to greenlight the project in the first place, so there’s definitely the possibility it could happen. Plus, he tweeted earlier that the story is canon, so she exists. There are comic moments the show should never use, and many (mostly involving Negan) that should be faithfully recreated. We never really can tell what changes will happen, but Claudia provides the rare commodity of a limited character foundation that could be taken in a dozen different directions without going against anyone’s better wishes. Plus, even though she was on the page for such a short amount of time, she's still far more interesting than all but one or two of the other female characters that get introduced in the comics after this point in the TV show's storyline. Make it happen, Kirkman and Scott Gimple. The Walking Dead won’t return to AMC until October. But in the meantime, check out everything else premiering in the next few months, check out our summer TV schedule. And seriously, go buy that comic.